The taste of a fried green tomato is delectable; but still, the taste is as difficult to describe as a good Morel Mushroom. You just have to try them for yourself. I will say that they do not taste like tomatoes. 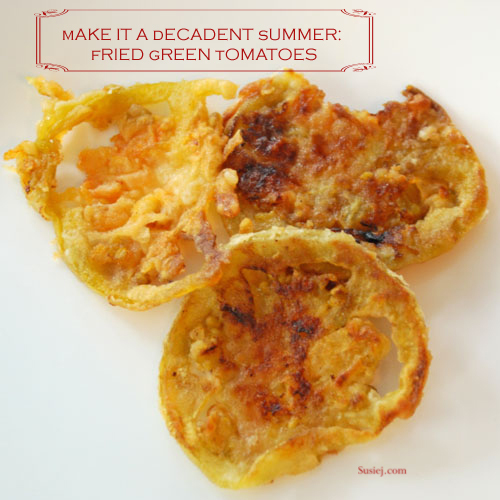 Even though I’ve been eating them since I was four years old, I’m always surprised each August when I take a bite of a fried green tomato; the memory of that taste seems to fade as quickly as the summer heat. Eating one is like taking a trip to a foreign exotic land, and sampling their strange and exotic food. Now that my Grandma has passed, if I want a plate of fried green tomatoes, I’ll have to fry them myself. Unfortunately, when I fry them, the serving plate never gets full enough to share with others, because I eat them as fast as they cook. So now that August is here, and tomato vines everywhere are bursting with green tomatoes (you can even find them in the produce section at Kroger), pick some and fry them. When you’re looking for green tomatoes, pick the ones that have a blush of red– they taste the best. Next, slice them as thin as you can. You don’t want them paper thin… but almost. Next, figure out which pan you’ll use. A cast iron skillet is perfect… but may not be large enough if you’re inviting me. Heat half of the oil in the skillet on medium heat. Wait until it’s hot before you start adding the tomatoes. I like to mix the salt and pepper into the flour; some people like to salt the tomatoes and let them sit for a minute before you coat them. You can try it both ways. Dip tomato slices in milk, then flour, then eggs, then flour. In the skillet, fry half of the coated tomato slices at a time, for 4-6 minutes on each side, or until brown. As the tomatoes start to cook, and as you cook the other half, you’ll need to add the remaining oil. They almost look as good as snickerdoodles. 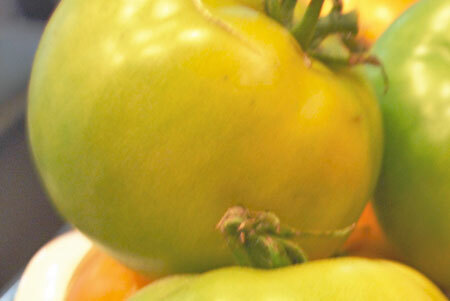 I’ve never had fried green tomatoes – shudder – so I’ll have to concoct a vegan version. 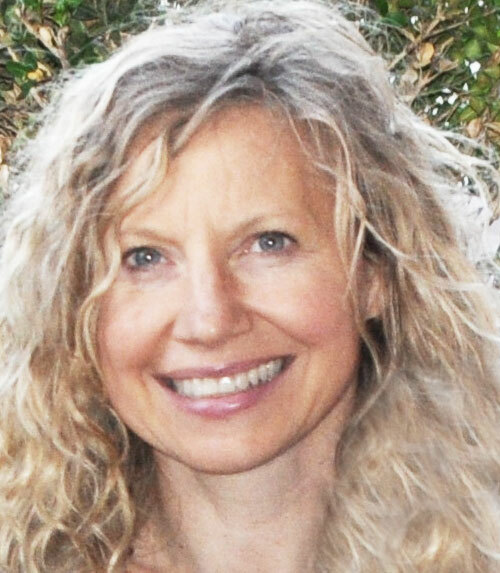 Thanks, Susie. I’ve never eaten fried green tomatoes. I have to admit I’ve wondered what they taste like. Maybe next year we’ll have a garden and tomatoes again and I can try them. I have never tried a fried green tomato, honestly I’ve never even thought about trying one. Perhaps I will feel brave enough next summer. This year? I’m not worthy. Thanks for this Susie! We have a couple bushels of tomatoes just ripening now! I’ve wanted to try the recipe but didn’t actually have it! Until now.